Clouds With Carl: Top 10 reasons why you should choose IBM Bluemix for your Cloud Platform as a Service. Top 10 reasons why you should choose IBM Bluemix for your Cloud Platform as a Service. 1. Partner with IBM to reach into enterprise for go to market opportunities. If you are trying to grow your Software as a Service (API economy) business beyond initial phases, you know that landing an enterprise customer can really make an impact to your bottom line. IBM operates in more than 170 countries around the world and has direct and inside sales forces that reach out to top companies in the world. Find a way to work with IBM to jointly pursue opportunities in cloud and drive enterprise customers to your applications and services running on IBM Bluemix. For example, OnFarm, a startup, worked with IBM to receive ongoing coaching, access to technology, mentorship and connections to venture capitalists, clients and partners. 2. Leverage a pipeline of talent grown by IBM through university & development outreach. Even if you have a phenomenal business plan, you will struggle to execute without the right talent in your company. 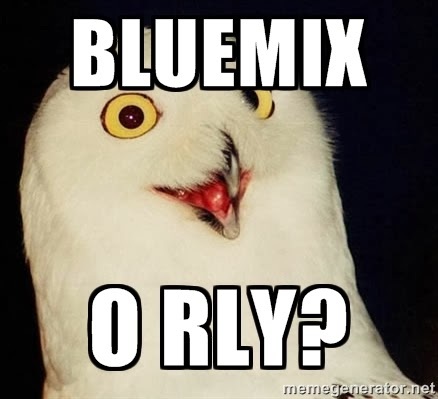 Did you know that IBM University Outreach is working with US universities to get students engaged with Bluemix? Combine that with developer focused conferences like Innovate@InterConnect along with many other outreach efforts and you have a growing talent pool of development candidates for your company. If you are a student or even just a developer interested in growing your skillset, you will want to know that Bluemix is built on Cloud Foundry, an open source platform as a service technology. This means that if you pick up IBM Bluemix skills you can apply them to any other Cloud Foundry deployment, including the one that you can build yourself. 3. Monetize your services through the IBM Bluemix services catalog. Shortly after the launch of Bluemix, many IBM business partners, including Ustream, started to offer services through the IBM Cloud Marketplace. You too can get a head start on your competitors by contributing your service to the IBM Bluemix catalog. Networked marketplaces like IBM Bluemix have a strong first mover advantage. Develop on Bluemix, create a service plan, become an IBM Cloud Marketplace business partner, and make your service a category leader! 4. Build on a responsive, global cloud infrastructure with world’s largest webhosting marketshare. Did you know that Softlayer, IBM's Cloud Infrastructure as a Service hosts more than websites than GoDaddy? You shouldn't be surprised if you've been reading about the reliability of the IBM infrastructure. IBM uses Softlayer not just for Bluemix, but also for customers like the Australian Open tennis tournament to ensure high availability and a great user experience. In contrast, offerings from Amazon Web Services has been suffering from numerous outages over the past year, including one as recently as Christmas time. 5. Meet enterprise class quality of service requirements in the cloud. Not all applications are created equal. Some need high availability & high performance relational databases. Others must satisfy complex regulatory compliance requirements. It is easy to become disparaged when you have to say no to a government or an enterprise customer because your service is missing a capability which you cannot afford to build yourself. Bluemix gives you a roadmap for how to evolve your application to introduce enterprise class capabilities that can help you pursue lucrative opportunities in large enterprise and government space. 6. Support migration of complex legacy applications to cloud with IBM’s flexible infrastructure . IBM Softlayer, the underlying infrastructure for Bluemix has been highlighted by Gartner for its range of features: from bare-metal to cloud servers, all managed through a common API. This broad supply of capabilities is why gaming companies like Multiplay and KUULUU with complex demands for their resource intensive games moved to the same infrastructure as Bluemix. 7. Deliver innovative services by working with IBM Research & Development(R&D) labs. IBM Bluemix is the only Platform as a Service out there featuring IBM Watson technology -- a recent Jeopardy winner. In addition to Watson, you can take advantage of other services created by IBM R&D, including a log analysis, auto-scaling, and many others. IBM labs also have customer advocates who can explore how IBM can help you on your opportunities. 8. Discover opportunities for innovation from a palette of IBM business partner services. IBM business partners have adopted Bluemix and made their services available for your use. For example, Zend Technologies provides support for their enterprise class PHP container which can be deployed to IBM Bluemix. Access to IBM business partner ecosystem can help you build your application faster, regardless of the technology, industry, or geography you are targeting. 10. Depend on IBM’s history of industry leadership for what is essential to your customers. IBM has been around for more than a century supporting technology needs of companies around the world. Some have said that the Western Civilization runs on the mainframe technology which IBM has developed and has been maintaining since 1960s. With IBM commitment to Cloud Foundry you can be certain that IBM Bluemix is the right foundation to develop applications for your most valuable customers.